Elkton is an unincorporated community located in central Elkrun Township, Columbiana County, Ohio, United States. It is located at latitude 40°45'43" north, longitude 80°41'56" west. The United States Postal Service has assigned Elkton the ZIP code 44415. (This is not to be confused with West Elkton, Ohio, which is in an entirely different part of the state.) It lies along State Route 154. Elkton was platted in 1835. The community derives its name from nearby Elk Run creek. A post office called Elkton has been in operation since 1838. The community thrived due to its location on the Sandy and Beaver Canal, but was in decline by the late 1840s when the canal became unprofitable and was suspended. Elkton is the location of a federal prison, the Federal Correctional Institution, Elkton. ↑ McCord, William B. (1905). 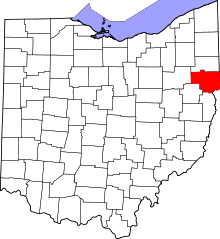 History of Columbiana County, Ohio and Representative Citizens. Biographical Publishing Company. p. 273. ↑ Overman, William Daniel (1958). 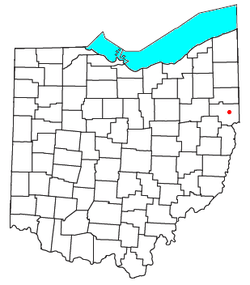 Ohio Town Names. Akron, OH: Atlantic Press. p. 42. ↑ "Columbiana County". Jim Forte Postal History. Retrieved 10 January 2016. ↑ Mack, Horace (1879). History of Columbiana County, Ohio: With Illustrations and Biographical Sketches of Some of Its Prominent Men and Pioneers. Unigraphic. p. 134.